The storm system that produced severe thunderstorms across portions of Florida Thursday has a mean back side that will sweep across the state Friday. High winds, dangerous surf, and coastal flooding are possible along all coastlines of the Sunshine State, and gusty winds might also cause minor wind damage in some inland locations. In the wake of the departing storm, a rapid pressure rise will produce a surge of strong westerly winds Thursday night over the Gulf of Mexico. 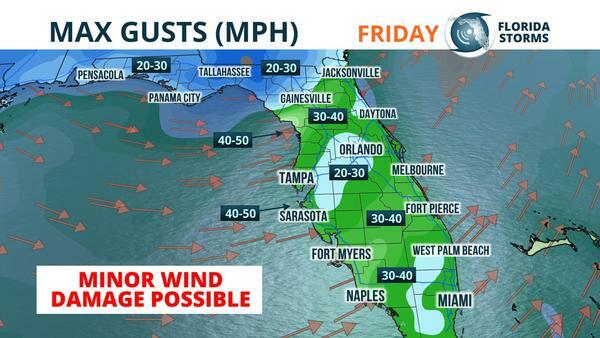 Gusts as high as 30 to 45 mph will reach Florida's coastline Friday, creating waves as high as 8 to 12 in some areas. The strong onshore flow will lead to a water rise of 1 to 2 feet above normally high ground and minor flooding of low-lying spots from the Nature Coast to Tampa Bay. On the Atlantic Coast from Jacksonville to Miami, the wind will primarily be offshore, but still strong. Gusts to 40 mph are possible just offshore, with wave heights generally in the 3 to 7 foot range. 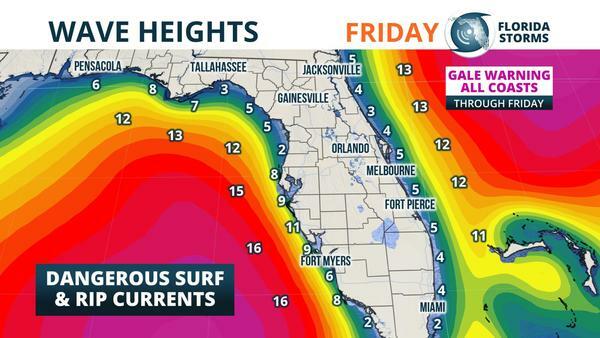 The risk of rip currents will be high at all Florida beaches through Saturday. Winds won't be as strong across inland areas, but still potentially hazardous. Given the saturated soil, wind gusts in the 25 to 35 mph range could still be strong enough to cause trees to fall. Residents statewide are encouraged to use caution when traveling and be cognizant of where you walk or park your car on Friday. Cooler and quieter conditions are expected across Florida this weekend, with long range forecast data suggesting a prolonged period of warmer and drier weather moving in next week.